"Well, we're at the right place"
Scampering past Piccadilly Gardens on his way from the station to Urbis, Mr Monkey noticed an iluminated sign advertising the exhibition. 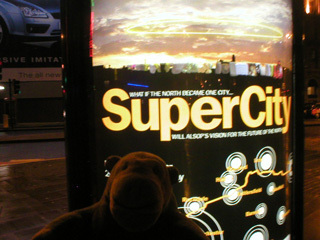 When he got to Urbis, he was pleased to see that they'd chosen a sensible colour for the word SuperCity. 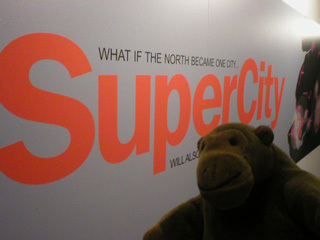 You can read about SuperCity at the Urbis archive website.